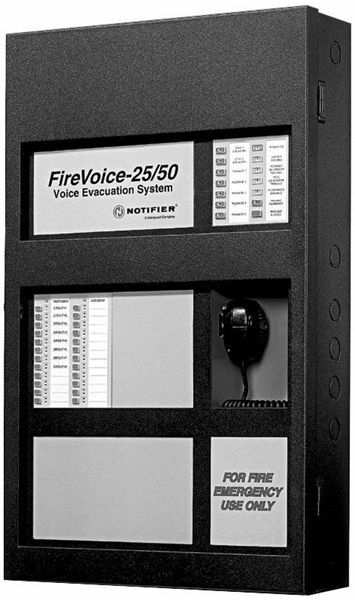 The FireVoice-25/50 (NFV-25/50) is a state-of-the-art, single or dual-circuit (25 watts each) Emergency Voice Evacuation Control Panel (EVAC). 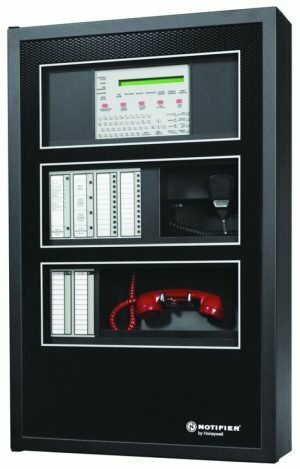 The NFV-25/50 records five field-programmable messages (up to 60 seconds total message duration) with an integral commercial-grade emergency communications microphone or from an external audio source. 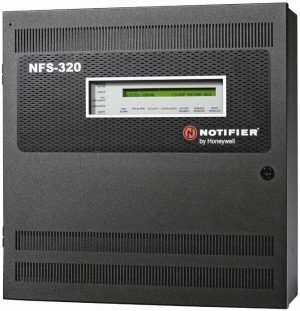 Significant technological enhancements set the NFV-25/50 apart from other EVAC panels – these include full supervision in both active (alarm or music) and standby conditions, supervision of amplifier outputs, field wiring, message generator, all tone generators, and the microphone. The integral power supply charges up to 18 AH batteries, which can be housed in the NFV-25/50 cabinet. 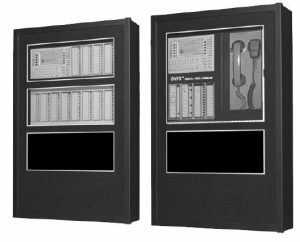 The NFV-25/50 is suitable for use as an adjunct (slave or stand-alone) to most UL-Listed Fire Alarm Control Panels (FACPs). An optional 25 watt, 25 VRMS audio amplifier is available for system expansion to 50 watts (providing dual 25 – watt speaker circuits) or as a secondary amplifier in jurisdictions requiring backup. A 70.7 VRMS converter is also available for independently converting amplifiers to meet retrofit needs. A host of field-programming options, including the capability of five custom messages (fire, tornado, evacuation, hazmat, non-fire, multi-language, etc.) 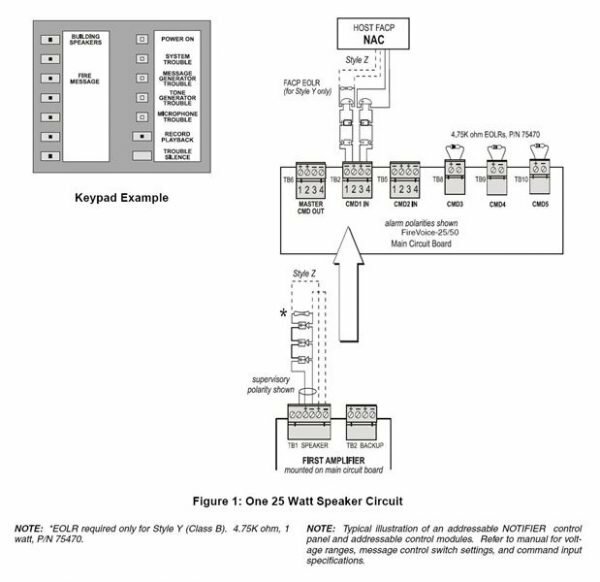 make the NFV-25/50 the most versatile voice evacuation system available. Suitable Applications include schools, auditoriums, dormitories, theatres, restaurants, places of worship, lodging, office buildings, and factories. Integral 25 watt, 25 VRMS audio amplifier with single Style Z (Class A) or Style Y (Class B) speaker circuit (expandable to 50 watts using the ACC-AAM25). Modular design for maximum system flexibility and ease of service. Five Command Input Circuits (CMD) are available for activation by an FACP. Two command input circuits can be independently field-programmed for activation by a Notification Appliance Circuit (NAC) or contact closure. Three command input circuits activate on contact closure. Manual deactivation of speaker zones. Command inputs allow: – One 60-second message. – Two 30-second messages. – Three 20-second messages. – Four 15-second messages. – Five 12-second messages. Nineteen different system and diagnostic LEDs. Two Form-C trouble relays (System & AC Power Loss). Optional equipment: second amplifier; local playback speaker; and remote microphone. Integral digital message generator with standard, factory prerecorded emergency evacuation message. Custom messages are field recordable, using the integral microphone or the audio input jack. Digital message may be field-selected for 3, 4, 6, 8, or infinite repeat. Built-in alert tone generators with steady, slow whoop, high/low, or chime tone capability. Alert tone selection may be field-programmed to conform with ANSI S3.41 Audible Emergency Evacuation Signal (Temporal Pattern), per NFPA. Speaker zone control via CMD inputs or keypad. Dual-optically-isolated, trigger input circuits are independently field-programmable for activation by polarity reversal (host FACP NAC) or dry-contact closure. Zone 1 switch-programmable for All-Call operation. Integral diagnostic LEDs include: Power, System Trouble, Microphone Trouble, Message Generator Trouble, Tone Generator Trouble, Amplifier Fault, and others. Independent Form-C trouble relay allows FACP to monitor voice system while in active (alarm) state. Integral piezo provides local audible indication for troubles. Fully supervised in Standby and Active states, including integral microphone, amplifier output, message generator, speaker wiring, and tone generators. Independent amplifier supervision: current limit, audio level, short circuit protection. Auxiliary power output provides local power for addressable control modules when used to activate the NFV-25/50. 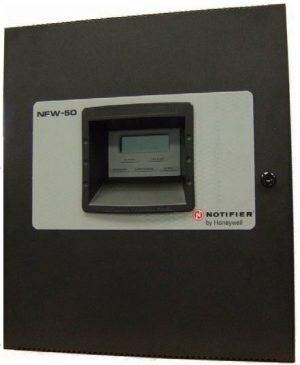 Compatible with all NOTIFIER FACPs, as well as other manufacturers’ panels. Background music capability (requires AHJ approval). When using the background music option, total output power per amplifier is reduced to 20 watts. ACC-AAM25: 25 watt, 25 VRMS audio amplifier module. Field-programmable for system expansion to 50 watts (providing dual 25-watt speaker circuits) or as a backup to the primary 25-watt amplifier where required. Single Class A or Class B speaker circuit. Plug-in-style terminal blocks for ease of service and maintenance. Fully supervised and power-limited. Diagnostic LEDs include: yellow “trouble” LED (cable fault, 70 VRMS fault, amp fault) and green “amp functional” LED. FC-XRM70: Converts 25 VRMS audio outputs to 70.7 VRMS for retrofit applications. Plugs directly on ACC-AAM25 module(s), allowing independent conversion to 70.7 VRMS. FC-LPS: Local digital message playback for user review of field-recorded custom messages. BAT Series: Two batteries required. See FACP manual for specific current requirements. See data sheet for overview of batteries. NFV-TR: Optional trim ring for semi-flush mounting. VEC-RM: Optional remote microphone, includes backbox. Only one VEC-RMper system. Command input circuits (CMD1 and CMD2): Trigger input voltage: 10.5 – 29 VDC. NOTE: When programmed for reverse-polarity activation. Trouble contact rating: 2.0 A at 30 VDC (resistive), 0.6 A @ 125 VAC (resistive). Auxiliary power output: Specific application power: 24 V, 35 mA. Primary (AC) power: 1.6 A maximum @ 120 VAC, 50/60 Hz. Secondary power (battery) charging circuit: Supports lead-acid batteries only. Maximum charge current: 800 mA. Maximum battery charging capacity: 18 AH. Door: 26.174″ (66.482 cm) high x 15.780″ (40.081 cm) wide x 1.125″ (2.858 cm) deep. Backbox: 26.0″ (66.040 cm) high x 15.5″ (39.370 cm) wide x 4.75″ (12.065 cm) deep, depth includes door. Zone 1 (green = Active, yellow = Manual Deactivation). Zone 2 (green = Active, yellow = Manual Deactivation). Other system LEDs: Battery Trouble, Charger Trouble, Ground Fault, Speaker Circuit Trouble, and Amplifier Supervisory. 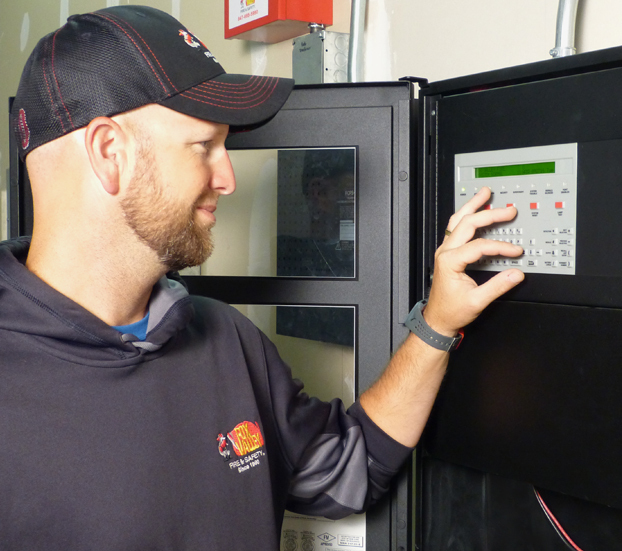 The NFV-25/50 complies with the following standards: NFPA 72 National Fire Alarm Code; NFPA 101 Life Safety Code; UL 864 Standard for Control Units for Fire Alarm Systems. These listings and approvals apply to the basic NFV-25/50. In some cases, certain modules may not be listed by certain approval agencies, or listing may be in process. Consult factory for latest listing status.